These settings are for advanced users. You can break functionality of your device. Anytime you can restore original values via Lite web app. ///             (eg '0-5, 9, 11, 12-17'). The indices are zero based. /// Next to the list with color transforms there is also a smoothing option. How to reset Wi-Fi settings? Maybe you mistyped your Wi-Fi password or you want to revert changes back. To change your Wi-Fi settings once your AmbiScreen box is not able to connect to your internal Wi-Fi network, follow these steps. connect your AmbiScreen device with LAN cable to your internal network. Your router in your internal network will assign new IP to your AmbiScreen device. Check your router’s DHCP table for assigned IP. 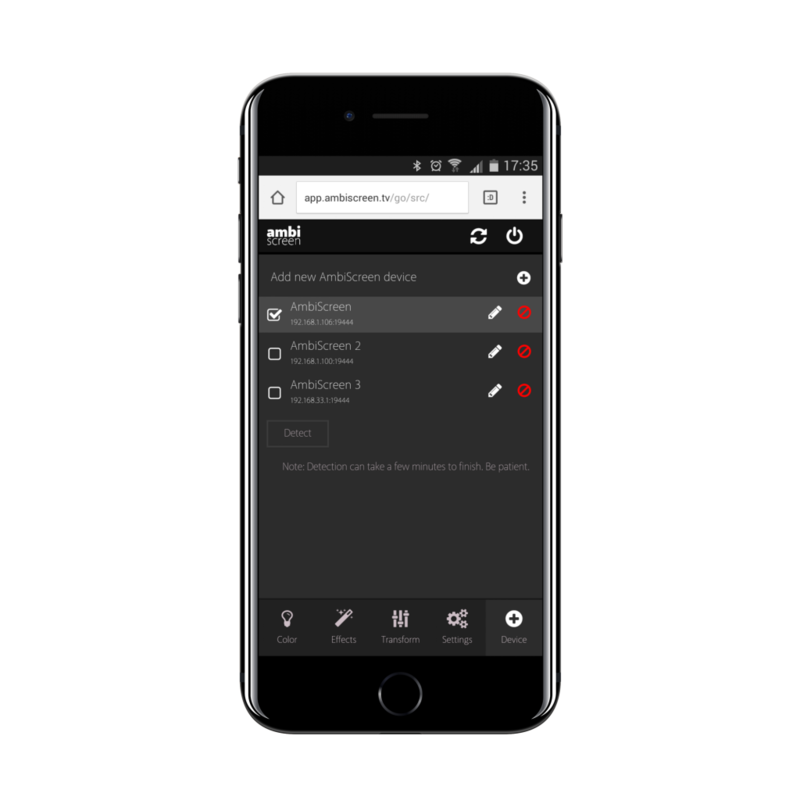 Open AmbiScreen webapp and navigate to Settings » Wi-Fi. Or navigate your webbrowser with http://your_device_IP/ and choose Lite settings webapp (or http://your_device_IP/app/settings_wifi.php in case you didn’t do firmware update) and navigate to Settings » Wi-Fi. There you can change your Wifi settings and Save changes. 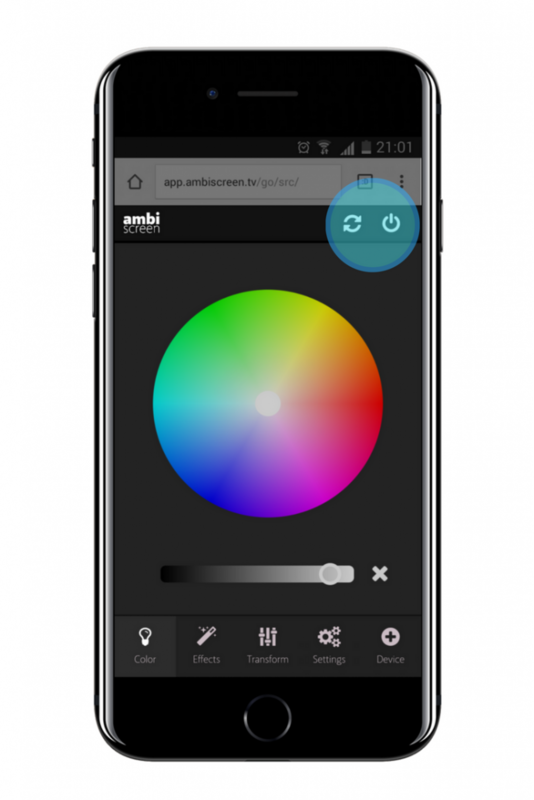 AmbiScreen can be controlled from any device (mobile, tablet, pc, Mac, desktop, etc.) and any OS via webbrowser without need to install any app. There are two standard ways how to control it – AmbiScreen Webapp and Lite settings webapp. AmbiScreen Webapp is available at http://app.ambiscreen.tv (via webbrowser). To establish connection with your device via webapp navigate to “Device” tab. Then you can find AmbiScreen device by clicking on “Detect” (please, be patient, detection can take few seconds up to minutes to finish according to your network). Or you can set connection to your device manually. Click on “+” sign (right top) and insert Name for your device and IP to Address field. Then click “Add”. Your browser stores these settings for future use. You don’t need to setup connection settings next time you open browser again. 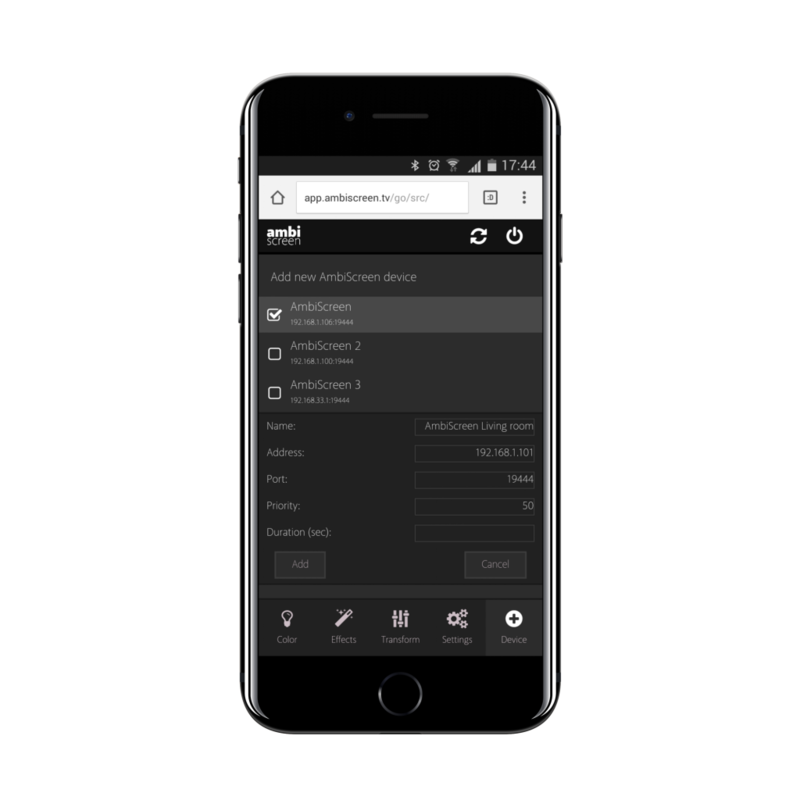 AmbiScreen Lite settings webapp is available at http://your_device_IP (via webbrowser). This webapp is just lite version and the main purpose is to be able to access basic settings. How to restart my device? It is possible to restart your device in several ways. Use webapp and click on “Restart” under Settings. Navigate to http://your_device_IP/restart/ via webbrowser. Unplug your device from power and replug it after few seconds. How to switch off/on LEDs? If you need to switch your LEDs off for longer time, you can use webapp to do it and tap on Power icon to switch LEDs off (blue circle, the right one button).. When you want to turn on LEDs again, tap on “Refresh” button. Switching back from static color or effects to live mode is done by taping the same “Refresh” button (blue circle, the left one button). Note: We recommend to unplug your device from electricity when you don’t use it for longer time. How to switch between color modes, effects and live mode? You can choose between static color, color effects and live mode via webapp. Switching between static color and color effects is possible by taping selected color on color wheel or choosing preferred light effect from the list of Effects. If you need to go back to live video mode, click on “Refresh” switching button (blue circle, the left one button). 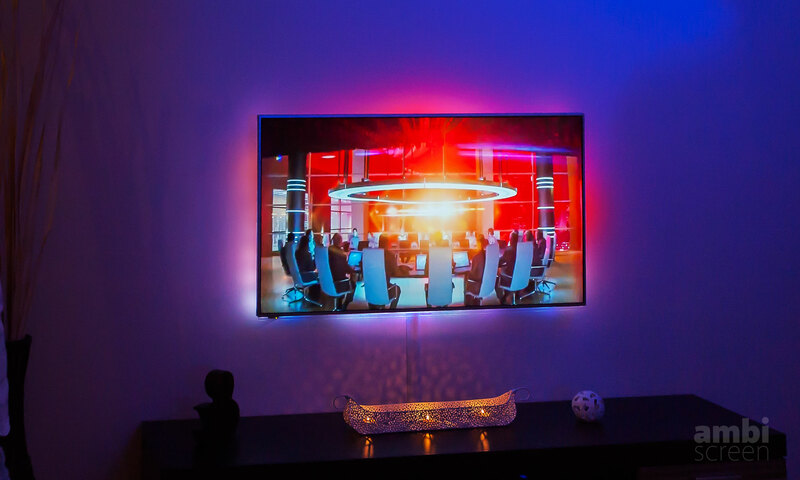 How to recover LED default settings? Sometimes you may need to recover factory settings for your LEDs. Simply navigate via webapp or Lite settings webapp at Settings » LEDs page and click “Recover default values”. Factory default settings for LEDs will be recovered and your device reboots to take these settings in action. Picture Diagnose feature at Settings page is here to help you fine tune AmbiScreen settings according to your hardware display/player setup when navigating to Settings » Diagnose page (accessible via webapp and Lite settings webapp). Two main features in Diagnose are available – live Screenshot preview and option for downloading Configuration file. 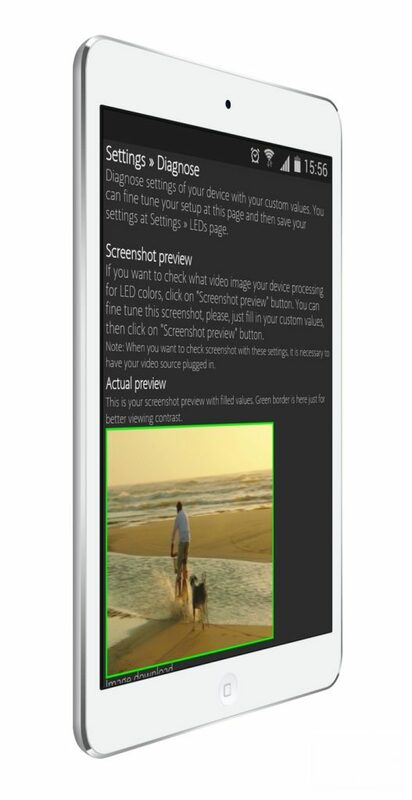 If you want to check what video image your device is processing for LED colors, click on “Screenshot preview” button. You can fine tune this screenshot, just fill in your custom values, then click on “Screenshot preview” button. You will see screenshot with your custom values. Note: When you want to check screenshot with these settings, it is necessary to have your video source plugged in. All values can be fine tuned, such as image width, height, frameDecimation, sizeDecimation, cropping and color signal thresholds. When you are satisfied with your results, please, fill in the same values on Settings » LEDs page and click “Save” to take effect the new settings. Your device will reboot with new settings. Your LEDs turn off while generating screenshot. After taking screenshots you will need to click on “Restart” button to reboot your device and turn on your LEDs again. If you need to contact AmbiScreen support, we can ask you to send us this file. To download it just simple click on “Download configuration file”. How to adjust video settings for my setup with Diagnose interface? You can fine tune AmbiScreen settings according to your hardware display/player setup when navigating to Settings » Diagnose page (accessible via webapp and Lite settings webapp). 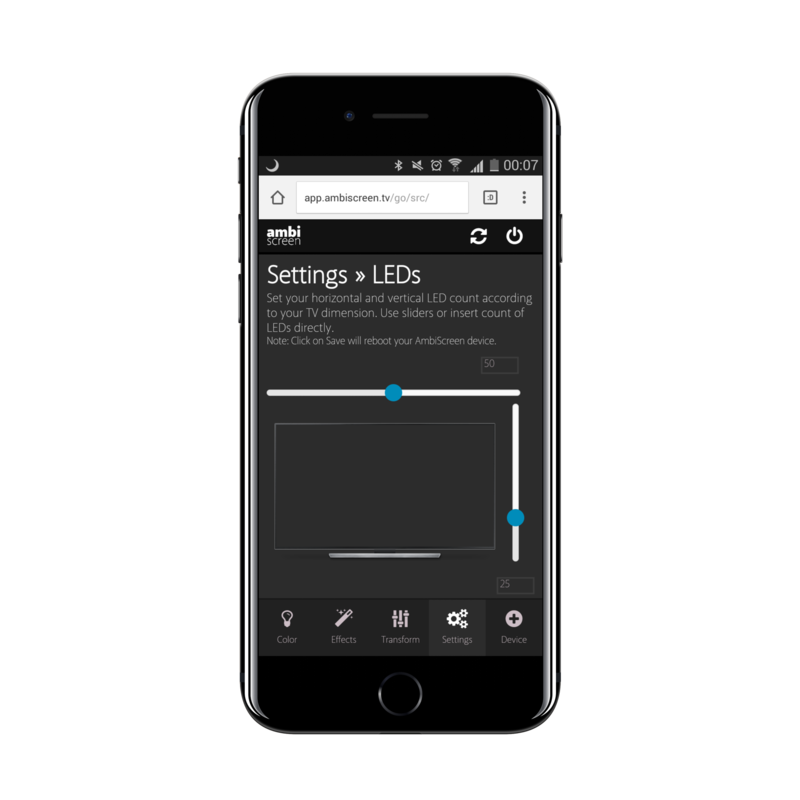 Here you can find values and description for your AmbiScreen LED strip for Settings » LEDs (accessible via webapp and Lite settings webapp). AmbiScreen LED processing is based on Hyperion project, as well as values below. LED count: First of all you will need to set horizontal and vertical LED count with value sliders or simply type in number count. The remaining LEDs will stay unused and turned off. Input signal: You can choose which signal to process, digital HDMI video or analog video over CVBS/RCA cinch/SCART. These settings help you to adjust your AmbiScreen device for your specific setup. Just consult our wiki in article how to adjust your setup with Diagnose feature. No signal detection will turn off blue LEDs after few seconds when no input signal is detected. After few hours of no signal, blue LEDs may turn on for few seconds for signal detection again, and then turn itself off (if no signal is detected). If no signal detection turned LEDs off and then video signal becomes available again, device will respond automatically. You are free to play with these values and tune it up for your specific hardware setup. Side effects such as flickering or pulsating are caused just by these settings so you need to tweak it sensitively.